This hard-working Station comes with a behind-the-bowl bottle well for shampoo & conditioners, a lift-lid over the bowl for that extra work-surface, a backsplash, two full-extension drawers, two storage cabinets w/ adjustable shelves, and a convenient tool panel with holders for blow dryer, two curling irons. Electricity by customer. 59"W x 15"D x 39"H including the angled tool panel. 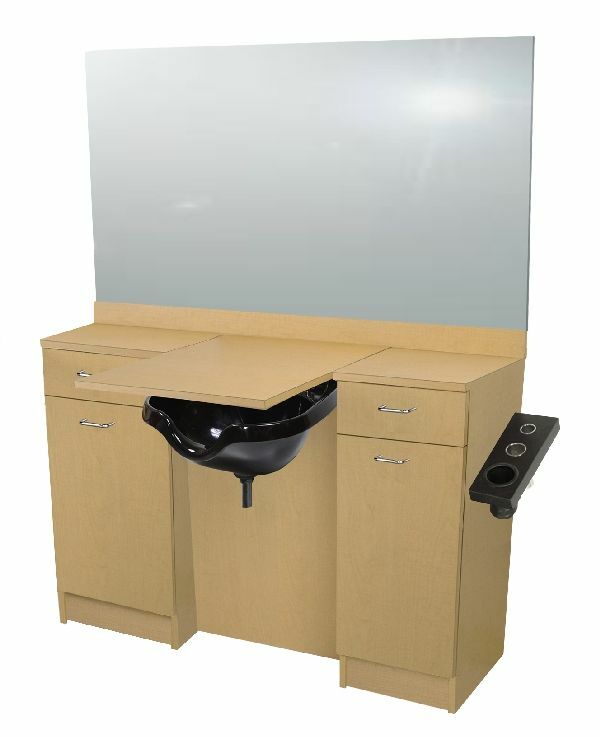 The pictured 8900 Over-Sized ABS bowl and wall-mounted 36" x 54" mirror are ordered separately.